How Long Can Head Lice Live Off The Human Host? Lice - the pest we all wish we didn't have to know. When an infestation strikes the game is on. We'll do all we can to get them out of our hair and out of our house! But how can we be sure they're gone for good? First, we need to understand the life cycle of the louse. Day: from the laying of the egg to about 6 days after. Appearance: A very small off-white oval less than a millimeter in size at their largest and only about a 1/3rd of a millimeter when laid. Dead eggs are brown and collapses on the side. Many people mistake head lice at this stage for dandruff. The easiest way to tell which is which? Dandruff is easily removed - nits are not. "Nit" is the term for the egg state of a head louse. Nits are laid at the bottom of the hair shaft (within 6 millimeters for warmer climates, closer in cooler climate) in order To get the body heat they require for proper incubation, the female louse will lay her nits at the bottom of a hair shaft with natural type of glue she emits to help them stay in place. Day: Between 7 and 9 days from when egg was laid. Appearance: The head of the louse begins to emerge from the egg. Eggs that have the louse has already hatched from are pale, hollow with a hole on top and won't pop when squashed. Once it has emerged fully, it will no longer be considered a nit. Day: Between 8 and 9 days from when egg was laid. Appearance: The louse now looks like an insect but is still very small. They are compared to the size of a pin's head with the females being a bit larger than the male. Their body is yellowish to rust depending on how recently they fed. Day: Between 11 and 12 days from when the egg was laid. Appearance: As you might imagine, a 2nd instar head lice nympth looks quite similar to the 1st instar head lice nympth, only a bit larger. Day: Between 16 and 18 days from when the egg was laid. Appearance: Like those in the previous stage only larger yet. Adult lice are active and they can move quick. This is the stage at which reproduction and egg laying begins. In this time, the female can lay up to 90 eggs (nits). Day: Between 32 and 35 days from when the egg was laid. Appearance: How can you tell if a louse is dead? Remember they are typically quick and active. If you poke them and they don't move, they're dead. Of course, all of this only really applies to head lice living in their ideal environment, next to their feeding source, in our hair. How do head lice leave the hair? Contrary to popular belief, head lice do not fly or even jump, yet they can end up off the head and around our homes. With the heat of our body, they have a hard time telling the difference between our hair and the fibers of the hat we were wearing, or the blankets, pillow of carpet we were resting our head on. While we are in contact with these things, they may move off our head in search of a meal and be left behind. 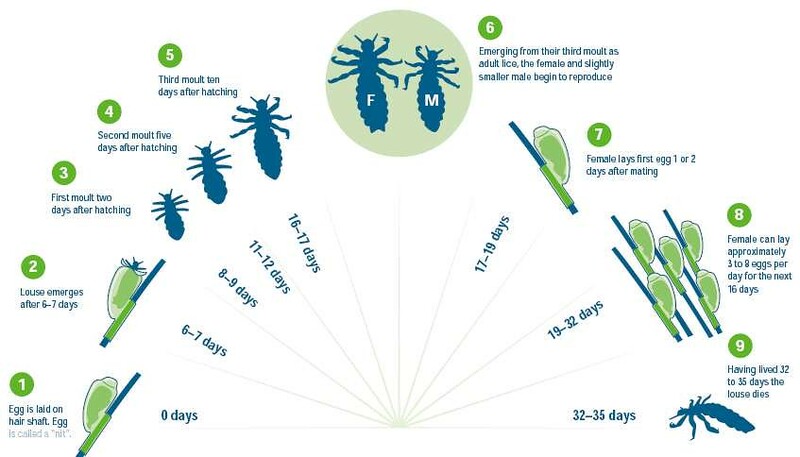 However, assuming they leave the scalp and do not find another host, or are not able to find their way back to their original host, a head louse will typically starve within 1 to 2 days. 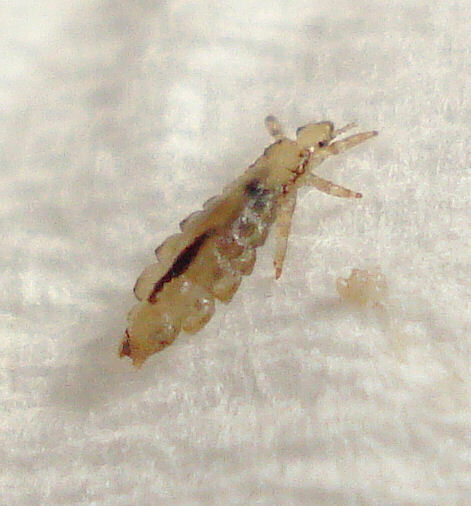 Nits can live off the host longer, but rarely become separated, as the female louse "glues" the nit to the hair strand. Nits often look like dandruff because of this, but unlike dandruff, cannot easily be brushed out of the hair. How can I prevent the displaced head lice in my home from reinfesting? While it's not likely that lice will live for long in your home, there is still a risk of lice spreading from one person to another. When a head lice infestation strikes don't panic, but don't delay in treatment either. Take care of your head lice in the hair immediately, and be sure to wash anything the infested person may have come in contact with. Vacuum the furniture and car just in case. Head lice, while a nuisance, are NOT a sign of uncleanliness or dirtiness. Anyone can contract head lice. If you or your child has head lice, don't spend time worrying about how you got it, just work on solving the problem!